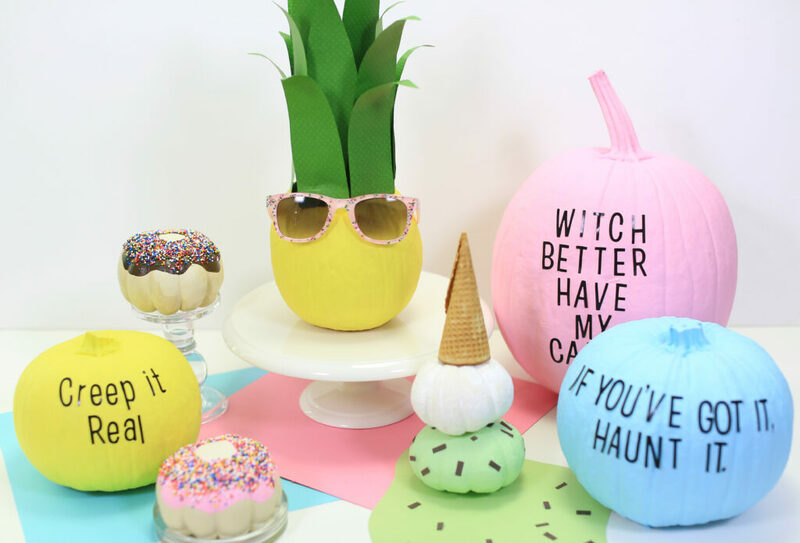 Recently on Kamri Noel, Kenzington shared 13 cute DIY Pumpkin Decorating ideas. They are all “no carve” DIY craft ideas. These were so cute I just had to share them with all of you! 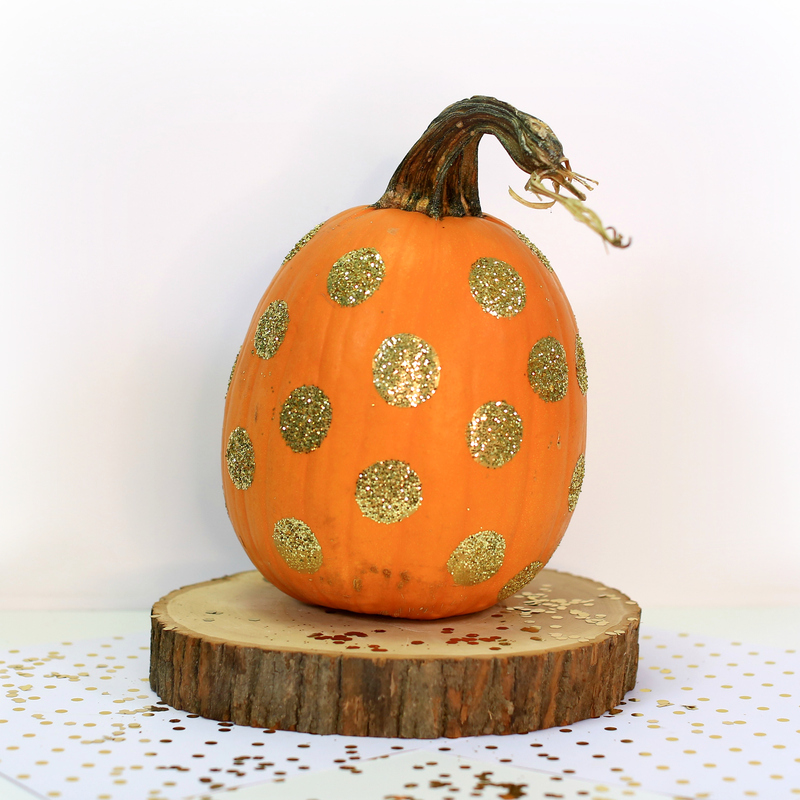 Glitter Polka Dot Pumpkin: Use a round foam dotting tool & craft paint to make dots. 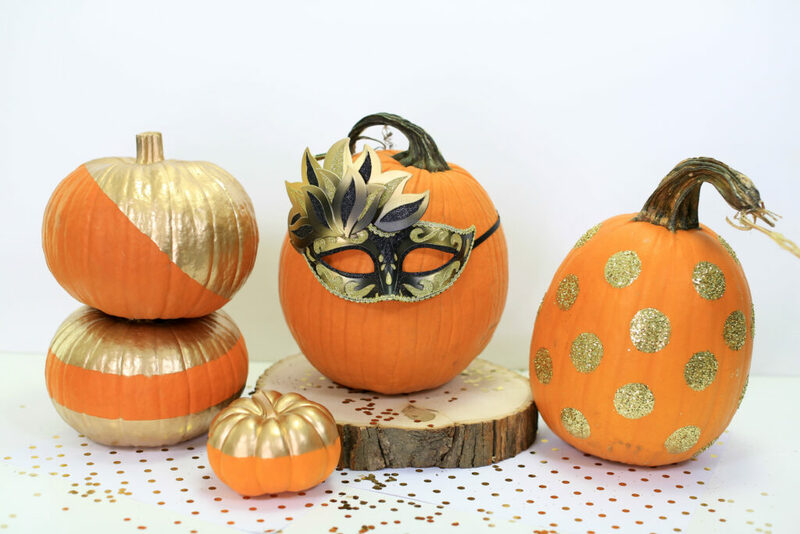 Add glitter and you get this cute pumpkin. 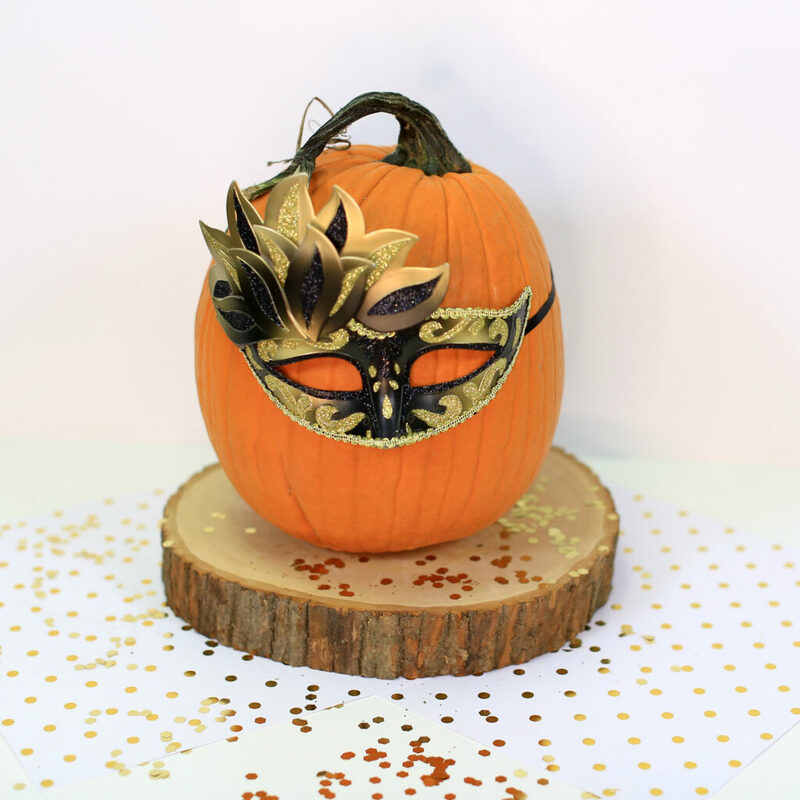 Masked Pumpkin: Take a cute mask and tie it around your pumpkin to make this masked pumpkin. Easiest DIY ever! 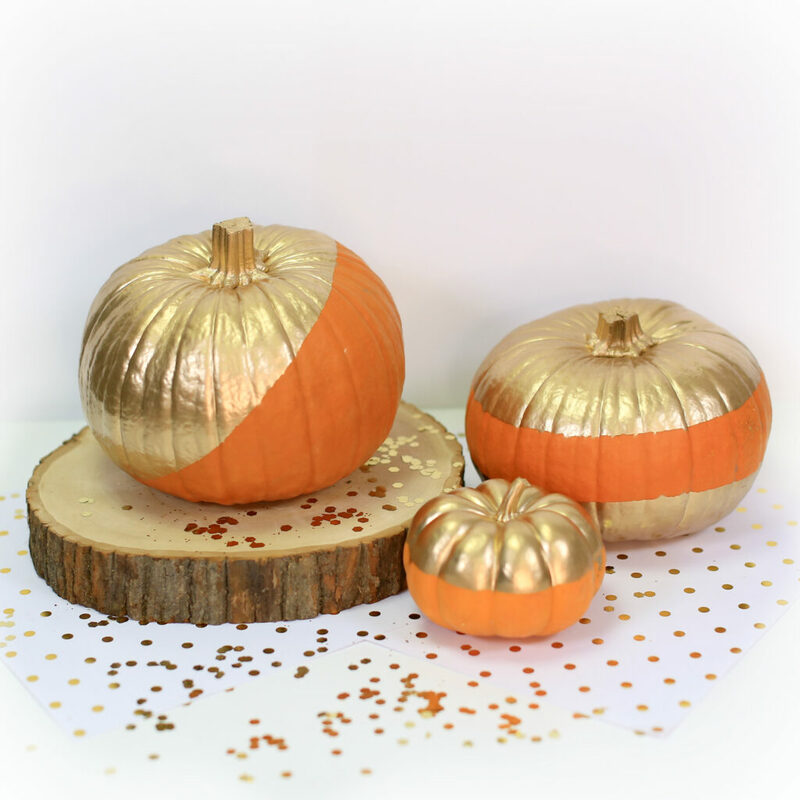 Metallic Pumpkins: For these you need painters tape and metallic gold spray paint. Tape off your design, spray & peel! 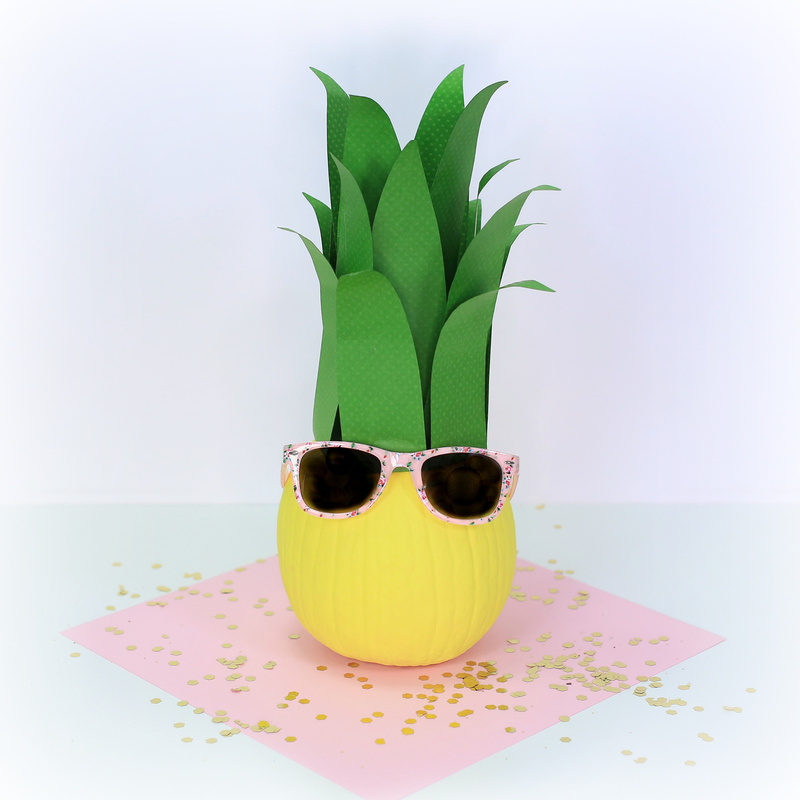 Pineapple Pumpkin: This cool pineapple needs yellow craft paint, green card stock & some cute pink shades. (Mindy’s favorite!) Paint your pumpkin yellow, cut out leaves, hot glue them on top and add glasses. 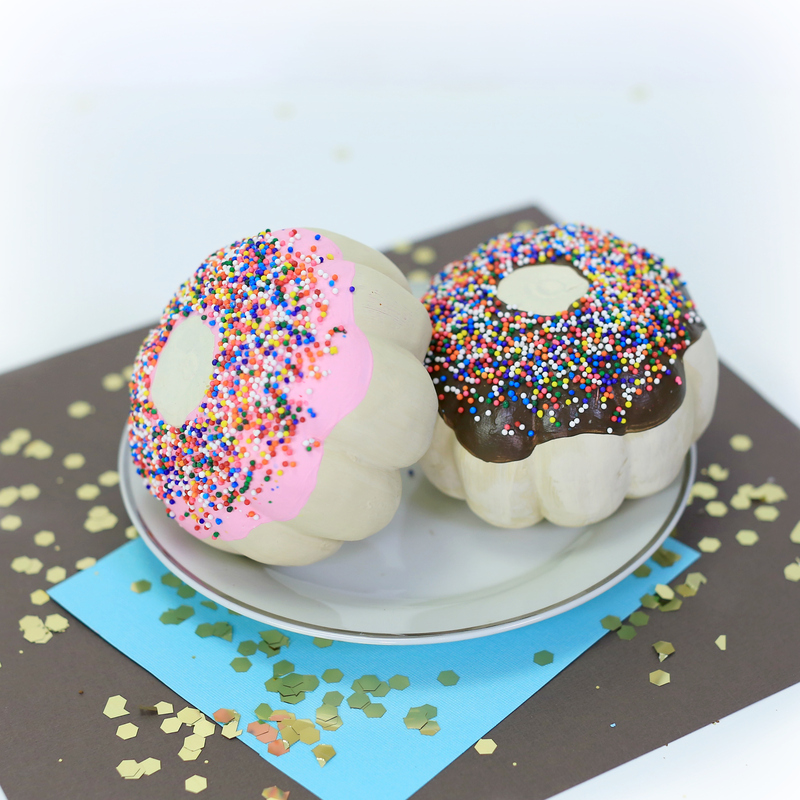 Donut Pumpkins: These mini pumpkins are easy and look too good not to be real donuts! All you need is craft paint and sprinkles. 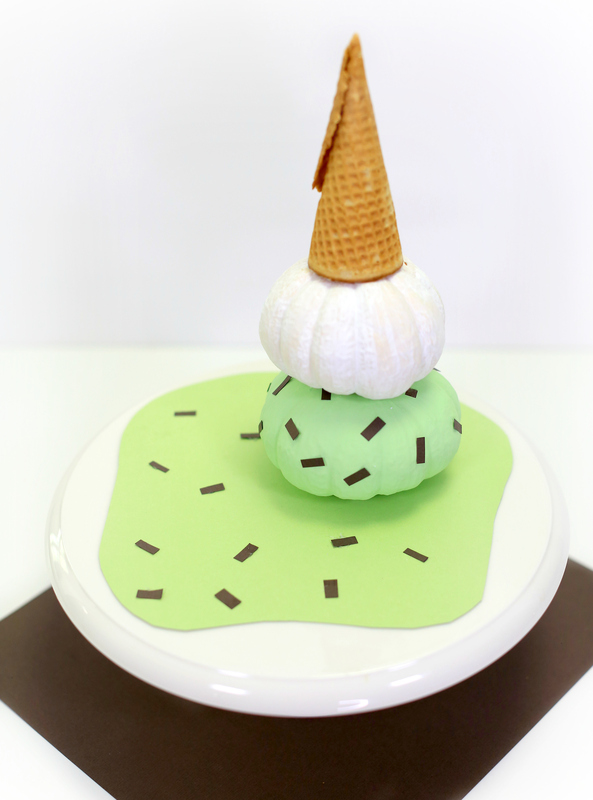 Ice Cream Cone Pumpkin: Using 2 mini pumpkins, simply paint, stack and add a cone! Mint Chocolate Chip is one of Kamri’s favorites! 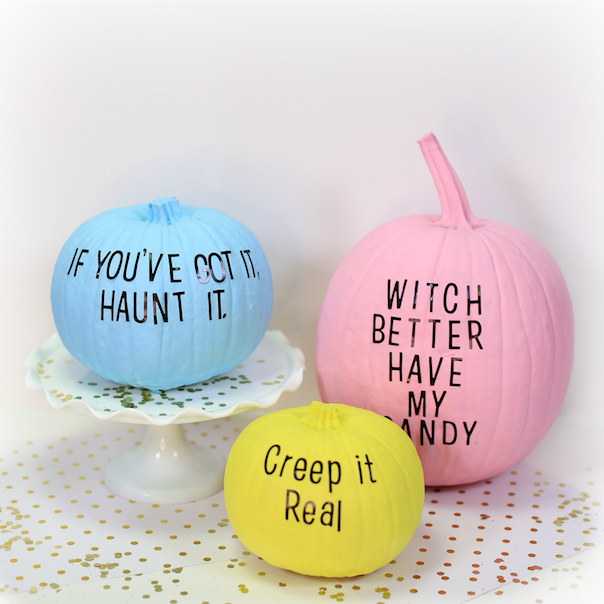 Sticker Pumpkins: These funny pumpkins were painted with craft paint and then cute Halloween phrases added with sticker letters. 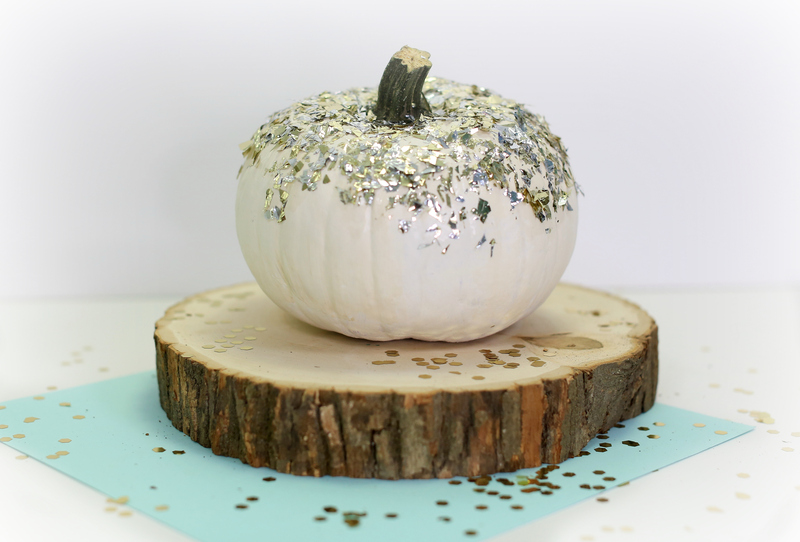 (Vinyl would work better if you have it) Confetti Pumpkin: Simply brush some ModPodge where you want confetti and sprinkle! 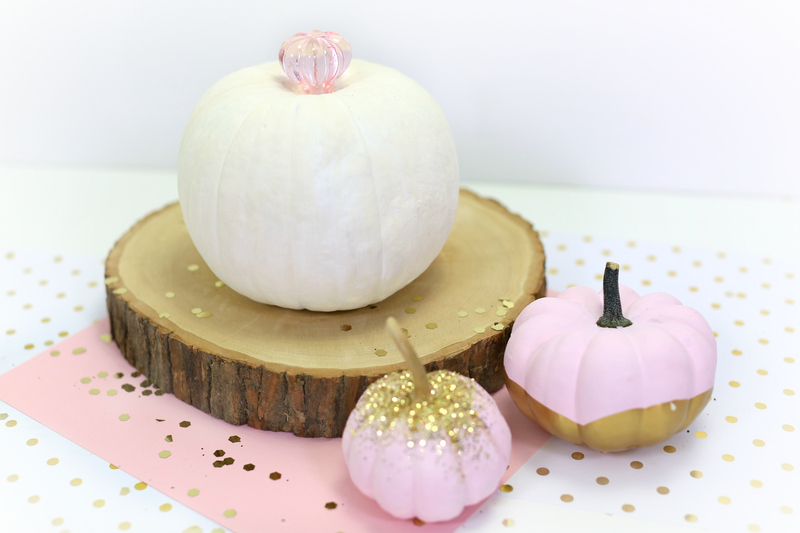 Dipped Pumpkins: We took a mini pumpkin and painted it pink. Then just dip in Metallic gold. Knob Top Pumpkin: This was so easy! Pop off the stem and add a decorative knob! 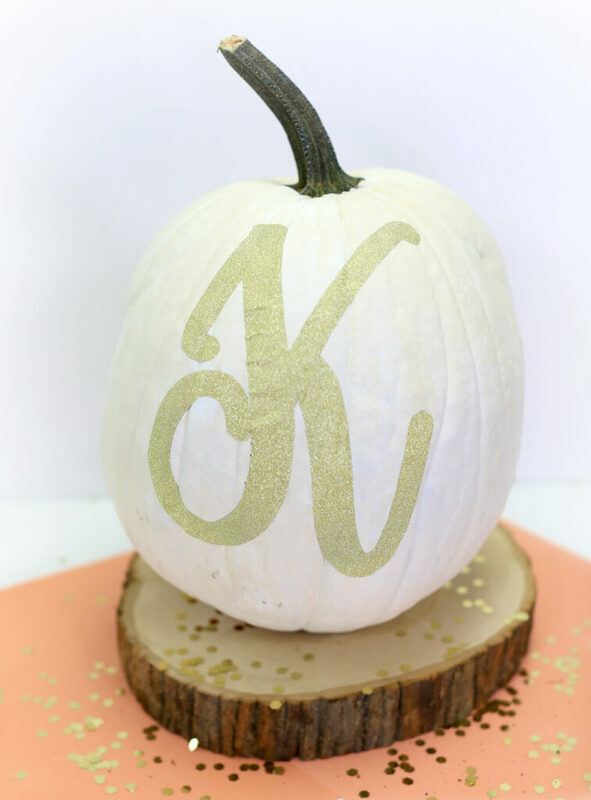 Monogram Pumpkin: Print & Cut out your initial to use as a pattern. Trace on to sticker paper and place on your pumpkin! 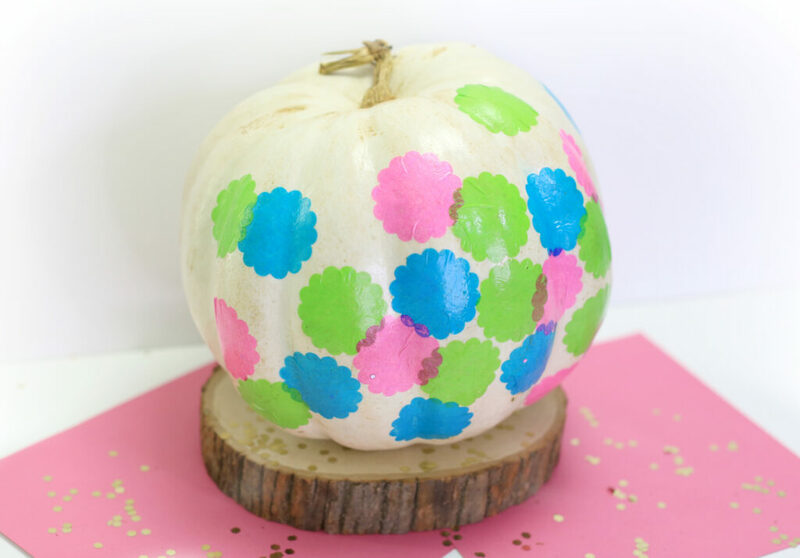 Mod Podge Pumpkin: To create this pumpkin you just need a paper punch, tissue paper and Mod Podge. 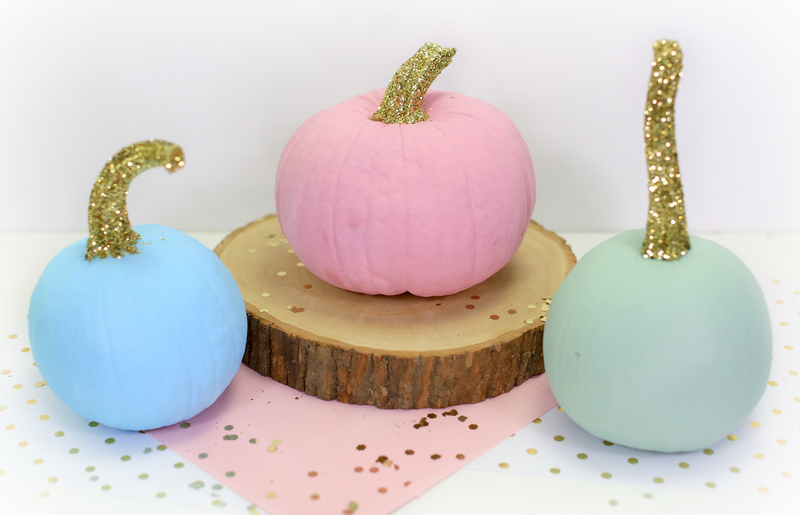 Glitter Stem Pumpkins: Paint your pumpkin with craft paint. Paint the stem with Mod Podge and sprinkle with glitter! There are so many cute ideas. Which is your favorite? To see how to make them, click on the link below!